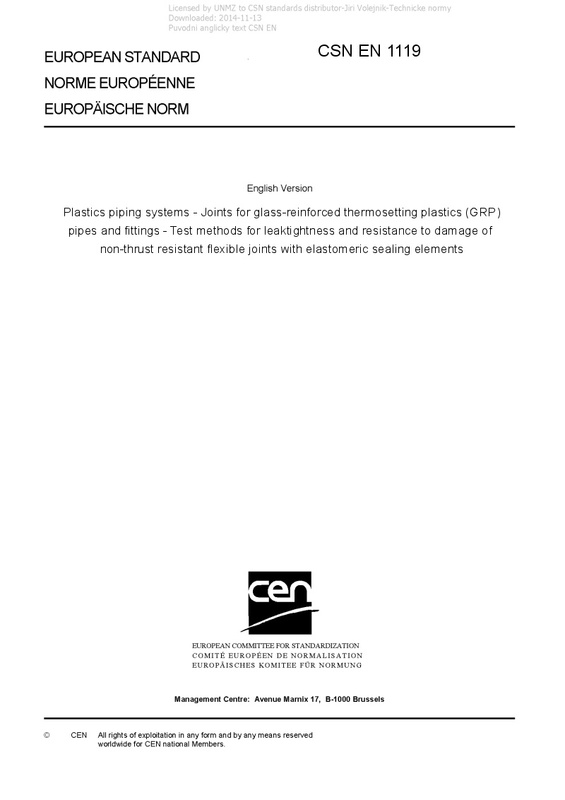 EN 1119 Plastics piping systems - Joints for glass-reinforced thermosetting plastics (GRP) pipes and fittings - Test methods for leaktightness and resistance to damage of non-thrust resistant flexible joints with elastomeric sealing elements - This European Standard specifies test methods for flexible non-thrust resistant socket-and-spigot joints with elastomeric sealing elements for buried and above ground glass-reinforced thermosetting plastics (GRP) pipeline applications. It covers methods of test for the leaktightness and resistance to damage of the joint only, when subject to specified combinations of longitudinal extension (draw), angular movement (angular deflection), compression (misalignment) perpendicular to the pipe axis and internal pressure. This European Standard is applicable to joints for either pressure or non-pressure applications. NOTE The joints tested in accordance with this European Standard are subjected to conditions which measure their ability to function and thereby prove the design of the joint, especially for type test purposes. These test procedures are applicable to joints for pipes and fittings of all nominal sizes. The tests are suitable for the evaluation of joints intended for applications in which the liquids are conveyed at temperatures specified in the referring standards.